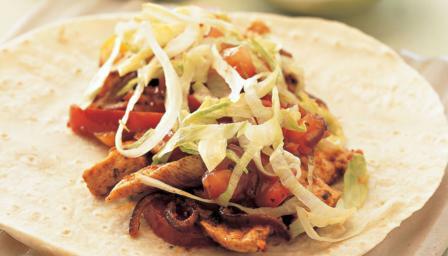 Fajitas are a fun meal to cook for the family. Try topping with homemade salsa to make them extra delicious. This meal is <a href=_http_/www.bbc.co.uk/food/collections/low-calorie_recipes__low.html calorie</a> and provides 418 kcal, 35g protein, 47.5g carbohydrate (of which 11g sugars), 9g fat (of which 3.5g saturates), 8g fibre and 1.2g salt per portion. For the chicken, heat the oil in a wok or large nonstick frying pan, add the onion and peppers and stir-fry for 3-4 minutes. Add the chicken, paprika, chilli powder, cumin and oregano and cook for 5 minutes, or until the chicken is cooked through. Meanwhile, wrap the tortillas in foil and warm them in the oven for 5 minutes.